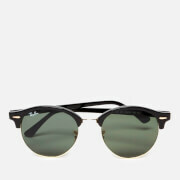 The retro-inspired Round Metal Sunglasses from Ray-Ban have an unmistakable curved brow bar design and were popular throughout the seventies. 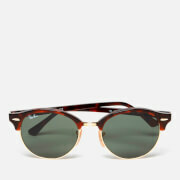 Sometimes referred to as 'Teashades', the sunglasses are made with slim, lightweight metal frames. The round lenses are durable RB3447 green classic G-15 and are characterised by blocking out most of the blue light to provide remarkable colour contrast and clarity of vision. 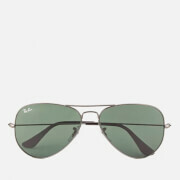 Constructed with adjustable nose pads and ear pieces for comfort, the unisex sunglasses feel as good as they look. Finished with the brand's signature monogram to the lens. E.N. Eye Width: 50mm. Bridge Width: 21mm. Temple Length: 145mm.